The story of the monument starts long ago. In the morning of April 24th, 1856, Samuel Cox set out to do some hunting from his family’s small house in an area known as Spruce Hollow. When he returned later, he and his wife discovered that their two sons, Joseph (age 5) and George (age 7), were missing. Mrs. Cox thought maybe the boys followed their dad hunting without him knowing and may have gotten lost in the woods. Even to this very day the woods in that part of the mountains are very dense and deep you can be easily lost in them. My father and I were hunting in the woods of Bedford County one time and ended up getting lost for quite a while. Back then I’m sure it was even more difficult to find your way around, especially if you’re a small child with wolves and other ferocious creatures lurking about in the darkness. Samuel scoured the area around his house but could not locate them. He asked neighbors in the surrounding area for help, but after a long search no trace of them could be found. It was getting dark out and it broke everyone’s hearts knowing the boys were all alone and without food and shelter in the cold snowy mountains. Hunters, trappers, neighbors and everyone from far near joined in the search. As time went on over a thousand people were involved in the search for the missing boys. Large fires were built on ridge tops in the hope that the children would see one of the fires and make their way to safety. As day after day went by with no sign of the boys, rumors began to spread about the area and people started questioning whether or not the boys actually disappeared. Some laid the blame on the parents for secretly murdering them. One man in particular, Charley Ross, ended up searching their house and torn through it. He dug up floorboards and gardens looking for any clues to their disappearance, but nothing was discovered. Neighbors and those involved in the search began getting desperate and turned to anyone they could for help. A colored man in Morris’ Cove was unsuccessfully brought into the search using dosing rods to try and locate them. Still others turned to a witch from Somerset County who ended up taking misleading everyone and taking a search party on a wild goose chase. About a dozen miles away from the Cox family lived Jacob Dibert. He experienced a strange dream that dealt with the disappearance of the Cox children. In his dream he was searching an unfamiliar area of the woods where he came upon a deer carcass on a trail. He continued on past the deer and found a child’s shoe and further on he came to a small stream with a fallen beech tree that allowed him to cross to the other side. Once he crossed the other side he found the boys dead underneath the roots of a fallen birch tree. Jacob told his wife of the dream, but they decided to keep it to themselves and dismissed it as nothing more than a dream. It was only after the dream repeated itself a few more times that Mrs. Dibert told him to go see her brother Harrison Wysong about it. Harrison was familiar with the area the boys disappeared in and he said the place described to him in Jacobs dream sounded a lot like a place he knew of. They two men quickly set out to find the boys and soon enough they came upon a deer carcass, a child’s shoe, a beech tree across a stream and finally to the bodies of the Joseph and Samuel Cox who had apparently died of exposure due to the cold spring nights and lack of food. The boys had been missing for about two weeks and were found on May 8th 1856 in exactly the same manner as in Harrison’s dream. No one searched near the area where they were found because it wasn’t thought they could cross Bob’s creek. Upon finding the children, church bells tolled all in small towns all across the Allegheny Mountains to let everyone know they had been found. The boys were buried together in Mt. Union Cemetery on May 8th, 1856. It was said over 5,000 people showed up for the funeral and it was the largest one ever in that part of the mountains. Grow up Brittney. I was there yesterday and today is the anniversary of their death. If there were spirits there it was because they new you kids (and I say kids because grownups dont act like this) had ill intentions.Go and pray for them (at a decent hour)and have some respect. "May God be with you" Don't get me wrong,I was teen once too and did stupid things. I'm only say this because I Don't want be to be afraid to go there. This was a tragedy. I grew up just a few miles from this site. I learned about it many years ago when I was small, and know where it is located. The path and site are now well marked, and taken very good care of. It is a very sad, true story of the boys disappearance and death. And of the dream given to this man on where to find them. But ghosts ... I for one do not believe those stories. I feel some people go there with over active imaginations. Possibly fueled by mind altering substances. I lived in Beaverdale for 10 years of my life. I'm 19 now, and about a month ago was the first time I saw this link posted to Facebook. I was reading up on the comments, and told my friends one night, "Guys. We're going there tonight." So the first night was about three weeks ago. I went to the Lost Children's the first time with my two friends, (Jade and Dylan) and the first thing that happened was a rock being thrown at my car. We wigged out and decided to leave. Went back about two more times after that, and not much happened. Then me and Jade decided to be ballsie and go by ourselves, and the second we got there, really didn't want to be there by ourselves. We both felt sick and very uneasy. It felt like something was getting really close to my car, so we decided to leave. The next night, me and Jade decided to take my friend Bry, and we were all sitting in the car, and Bry and I heard footsteps for a good five minutes (literally, right outside her car, sounding like someone was casually about to walk up to the car and get in) and as I looked up, I saw a man in what looked like a white t-shirt, tall and skinny with short hair, walking right beside the car. I started freaking out and told Bry to start driving and get us the hell out of there. The night after that, Jade and I went back and saw something walk in front of my headlights twice. Not much happened to us after that, then last night, Jade, Bry and I decided to take another trip down there for a girls night. The moon was almost full, and it was an insanely bad feeling. Bry told her boyfriend where we were going, and thank God he ended up showing up later in the night. We were already there about two maybe three hours, and Bry's boyfriend turned off his car, and I decided to do the same thing. Jade and I thought we saw something at about midnight, so I was about to rip out of there. I went to start my car, and it wouldn't start. I tried everything. When we told Bry my car wouldn't start, we all jumped into Dylan's car and had to drive the whole way back to Wilmore to get jumper cables. After getting in the car, Bry told us about how just minutes before we tried starting up my car, Dylan tried starting his, and it wouldn't start at first. We were all freaked out. We grabbed jumper cables and made our way back. I hurried up and unlocked my doors and decided to try my car one more time before trying to jump it, and it started perfectly. We all hurried up, got back in the cars, and ripped out of there. If you're going to go there, always take two cars and jumper cables if you plan on turning your cars off. There's no service back there, and no way to call for help. I live in Beaverdale, Cambria County,PA which is about fifteen miles from the memorial. Have been there many, many times. It is so quiet and it seems like a hallowed place. I grew up in Bedford County and have been to the site many times. As soon as you get within 100 yards of the site it becomes eerily quiet. The air has a strange smell and there is an overall heaviness to the air. You get the feeling as though your being watched. I havent been there for several years but the last time I was there I got almost nauseated. 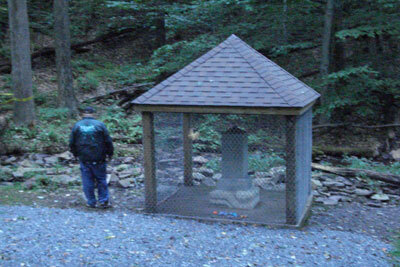 i live not far from where the monument is and i have never heard of this until i came across this on someones facebook page, they say the monument is in blue knob state park i live in claysburg,pa an blueknob is right up the road from me, so im going to have to check this out..
this is true. It is in Pavia PA. near Claysburg PA.. I actually was there when I was young !!! Rev. James A. Sell also wrote a book about the boy's story. More recently, Allison Krause did a song about the story. I remember my father sharing this story many times. We even read a book on it(not sure of the author or publish date). Also had the chance to visit the memorial with my family before it had to be protected from vandals. We took many pictures that day in the woods. This is the first I've heard of it being haunted. Although it felt like a sad place to me being a mom...we didn't witness any unusual activity that day. That's right down the road from my home place. We used to walk or ride bikes up there all the time. Never experienced anything like that but did see 2 guys skinny dipping in the creek!! Ghost hunting can be entertaining, but at this particular spot, a 5 year old and a seven year old finally succumb to the elements and dehydration. Let these little ones rest in peace, let this spot be remembered for them, and respected for that tragic event, not ghost hunting! and remembered for an honored Civil War veteran who gave his life eight years later for our freedom on Virginia's bloody soil, the man is Jacob Dibert, who found the lost children through an act of God via clairvoyancey, he is buried honorably in Arlington Nat'l Cemetery. He was assisted in the search by his brother in law Harrison Wysong, though Jacob went to his father in laws farm looking for aid from his father in law, his brother in law was there and aided him reluctantly. Please, please respect that hallowed ground, let them all rest in the peace they deserve. I was born and raised about 10 miles from this site and remember visiting the monument as a child with my parents when we were out for a Sunday drive back in the 1950's. I never heard of it. But will look into it!!! Hope to find it!! Will post on here if I do. W.P. Zimmerman- Phiadelphia possibly in early 1900/s. That story gave me the willies!! Wow, I have been up there plenty of times and always hoped for an experience, never got one though, I do have a picture from their grave that is pretty spooky! Does anyone know the route that JAcob Dibert and Whysong took? Is it the actual trail thre now? God Bless those two for finding them and having the courage to follow hints from a dream! That took GUTS!!!! I first heard the song on utube from a friend. Research led me to this page. Thank you for sharing your most chilling account of the experience at that place. Hope their's others like it to come in the future. I'm so impressed with your ghostly tale of The Lost Children of the Alleghenies. I have a friend, Patty Wilson and her team of paranormal investigators, have been going there to investigate this haunted site. They have also been gathering proof of the hauntings and rumors of visitors seeing and hearing strange events.